How I Gained It: I have always battled with weight issues and grew up in a family where food was the focal point of every gathering. I had gained and lost weight a number of times in my younger years, but by my mid-30s began to accept the reality that I would always be overweight and became less concerned about what I ate. In 2003 and the years to follow, I experienced a significant number of losses in my life. First, I lost a job that I loved and devoted myself to for 15 years. I moved 200 miles away from friends and family to begin a new job. Shortly after my move, I lost two very significant men in my life: my grandfather and my closest friend. I was with each of them as they took their last breaths. The grieving process began, but was compounded by the loss of my new job due to funding cuts. Soon I found myself unemployed again. I was far away from family and close friends and began to fill the void with food. I think subconsciously I was trying to protect myself from getting hurt again, so I created a barrier of weight around me to keep others away. I was in a lot of emotional pain, but was suddenly feeling a tremendous amount of physical pain as well. There were days when I could hardly walk, and none of the medications and treatments prescribed by various doctors seemed to help. About a year later, I was finally given a positive diagnosis of rheumatoid arthritis, but by that time, the pain was so great that I could hardly move. My initial treatment involved medications that made me vomit and feel sick all the time. The doctors prescribed several different medications, but none of them worked. I tried to cope with the pain, the realization that there is no cure for RA and that I would likely end up in a wheelchair before my 50th birthday. To deal with it all I ate more. I developed an addiction to peach soda, drinking at least two liters a day. Those extra calories and my lack of physical movement began to pack on the pounds. The heavier I got the more pain I experienced. Before long I weighed more than 400 pounds and was dependent on an electric wheelchair, wheeled walker or cane to get around. The physical pain was overwhelming and there came a point when I could hardly take care of myself. Breaking Point: I began to have several “epiphany” moments after my beloved grandmother died in January 2011, including a conversation in late February with my rheumatologist. During a routine check-up, I informed him that I couldn’t live with the pain much longer. He told me that he was at a loss as to what to do for me because we had already tried multiple medications with little relief. His words, “I think you ought to be less concerned about living like this, and more concerned with just living,” really hit home. I left his office thinking if he couldn’t do anything for me, perhaps I had better do something for myself. 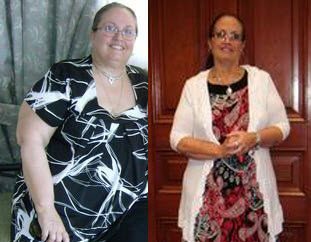 A couple of days later, on March 1, 2011, my sister called me to tell me that she had been scheduled for bariatric surgery. We had a rather tense conversation in which I begged her to reconsider the surgery; I was very afraid that something would happen to her and was opposed to her proceeding that way. She told me she had made up her mind and was going to have it. Well, that was the beginning of my journey! I hung up the phone, stated out loud, “I’ll show you,” opened my refrigerator and proceeded to dump the two-liter bottles of soda down the drain. I then dumped the contents of the sugar bowl in the trash, and from that point on, I never looked back. RELATED: In control of my own fate! How I Lost It: I didn’t follow any specific diet plan, but rather focused on calories. I began to read labels and purchased a calorie counting book off of eBay. I became extremely conscious of the number of calories I was accustomed to consuming on a daily basis, and began to limit my intake to around 1,000 to1,200 calories each day. I ate three meals and a snack, and started drinking a large amount of water with sugar-free flavor packets. I consumed between one and two gallons of water each day. 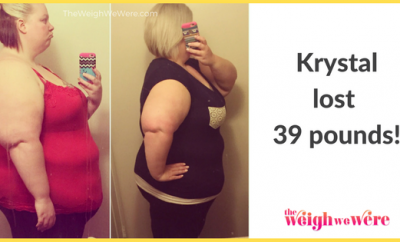 The weight began to fall off at a rapid pace. 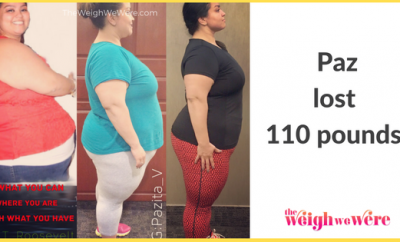 Because I was over 400 pounds, it took a lot of calories just to eat, sleep and breathe, so when I started shaving about 3,000 to 4,000 calories off my usual intake, I began to lose weight very quickly. These immediate results kept me motivated. Now, I am a totally new person. Although I still have RA (it never goes away), my symptoms have improved dramatically, and I no longer depend on a mobility device to get around. My motorized wheelchair sits in my office at work with a sign that says “Theresa doesn’t live here anymore” as a reminder that my motivation was to walk again. I no longer have to order clothes from a catalog and can shop in the Misses section and wear more stylish clothes. For the first time in my entire life I am at an average weight for my height and not considered obese. My medication needs have been reduced dramatically, my blood pressure has stabilized and I only need serious pain medications when the RA flares up. I’m not sure who this new person is when I look in the mirror, and I’m a work in progress, but I am so grateful to have been given this second chance at life. I am a walking, talking miracle and a participant in life as opposed to a spectator. Next Story → 62.3 Pounds Lost: Goaltending to meet my goal. Amazing! Thank you for sharing you look fabulous! Congratulations you did a tremendous job, good luck and you look great! Wow ! I love how she Turned it into mind over matter .amazing job. Seltzer is so much more delicious with no sugar or sweeteners. such a great thing you have done! It is a lot of hard work!!!!!!!!!!!! Awesome! I hope to do is one day! That is absolutely amazing! I love the part about the sign on the wheelchair! Congratulations! 11 months ago II too gave up soda and lost 18 pounds. I don’t eat pasta or breads and very little sugar! All natural foods!! Well done!! Amazing story. I also have RA and have found it difficult to lose weight over the years. Wow ! Truly amazing! Love your story! An amazing job ! Your look unbelievable! Fantastic. I’ve recently lost 70 lbs. I need to lose at least 100 more to get to a healthy weight for my height. I’ve gone off track and have put on a few pounds over the last couple of months. Thanks for giving me the motivation and inspiration to get back on track. I am determined to get to my goal weight of 140! Amazing. I’ve lost 112 lbs by giving up soda, breads and sugar. I exercise regularly too. The Weigh We Were.com of ice never thought about it. I’ll think about it. My goodness, these photos took my breath away and I gasped out loud. Your resolve and committment to losing weight is amazing. Well done and many congratulations! I’m on my 2nd time quitting sprite. So far the cravings r less. Congratulations on your amazing weightloss. What an accomplishment!! You look wonderful!! What an amazing great job! The love you have for your sister is greater then the love you had for food or yourself, your an inspiration! Blessing to you always! Good for you for taking back your life!!! I’m so happy for you congratulations for all your hard work it paid off. Thanks for sharing your story. Nothing tastes better than having good health and the ability to walk without assistance. Inspiring! Congratulations! Very inspiring to everyone! But it was only with diet or bariatric surgery was?? Incredible!!! Your life changes looks amazing on you! What an amazing transformation. I also suffer from RA and have found it hard to lose weight over the years due to my medications. Wow,she is truly an inspiration. You are a role model! Wow you look great! I really identified with your story. It’s time for me to give up pop again. Thanks for the inspiration! Congratulations on your hard work to achieve your goal. You are an inspiration to me and I’m sure other too. That’s awesome. That will be me in a year hopefully. so proud of this lady.shes beautiful.i have a lot of admiratation for people who try. OMG! what an amazing accomplishment! God Bless You, Theresa!!! I would love to know more about her journey. I have pretty much decided I will die this way. This weight is my prison. You can escape that prison Becky. I believe you can! Good luck! conratulation, you are just perfect. Wow. My mum was as big but passed away just a few weeks after some really great weighloss progress. These stories inspire me. I’m happy for anyone who chooses to better there health and bodies by loosing weight and not just for vanity and bikini comps. Great going!! You have inspired hundreds! Aren’t you proud? What happens w all the excess skin? Congratulations!!! You are a true inspiration for all of us. You could have taken the easy way and had surgery but you didnt! So proud of you! Wow! Way to go. You look fantastic! Way to go Theresa you look great! You look amazing! I am so proud of you! Very inspiring to me on my journey. Thank you. A true success story! I don’t think I have ever seen/heard of a transformation as awesome as yours! Congrats Theresa on getting your life back! Thanks but why was my comment deleted? BRAVO WONDERFUL AND I KNOW FROM EXPERIENCE YOU FEEL A LOT BETTER !!! Just another inspiring story to keep me going. Theresa you make me smile and know I can do this. What happened to her skin though?! Did it shrink that much on its own or did she have to have some surgically removed? 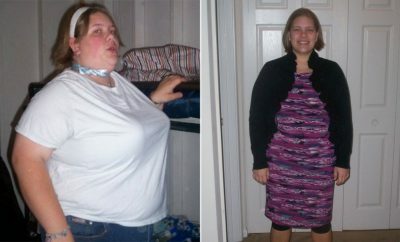 39 Pounds Lost: If I can do this so can YOU!